Professor Lord Baker was a structural engineer who led the engineering department in Cambridge for many years in the middle of the twentieth century. John Fleetwood Baker was born on 19 March 1901 at Liscard in Cheshire, and educated at Rossall School and Clare College. He was then Assistant Lecturer at University College Cardiff where he worked under Professor A J S Pippard. From 1928 to 1936 he was Technical Officer to the Steel Structures Research Committee where he promoted his new ideas of steel structures ("plastic theory"). In 1932 he was awarded the Telford Gold Medal of the Institute of Civil Engineers. 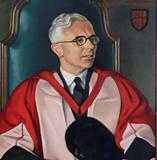 He was Professor of Civil Engineering at Bristol University (1933-1943). During the war he was also scientific adviser to the design and development section of the Ministry of Home Security, during which time he created the Morrison indoor shelter, which saved the lives of many. He became Professor of Mechanical Sciences and Head of the Engineering Department at Cambridge University from 1943, and Fellow of Clare College. He was made a Fellow of the Royal Society in 1956 and awarded its Royal Medal in 1970. He was founder member and Fellow of the Royal Academy of Engineering in 1976. He was appointed OBE in 1941, KBE in 1961 and made Baron Baker of Windrush in 1977. He died in Cambridge 9 September 1985. His main books were The Steel Skeleton (1954, 1956) and The Plastic Design of Frames (1969, 1971, with Professor Jacques Heyman).